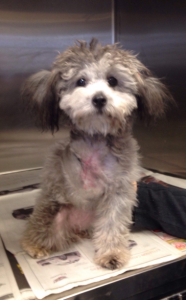 Abigail, a 7 month old female poodle, was presented late one evening with a bone sticking out of her right arm. Her arm had been wrapped with nylon gloves and packing tape to cover the exposed bone. The owners had noted that Abigail had originally fallen down the stairs about a week and a half earlier. Abigail had soon began self-mutilating her arm and was rushed to the hospital. Abigail was depressed and minimally responsive upon presentation. Physical exam showed she had started to go into shock. 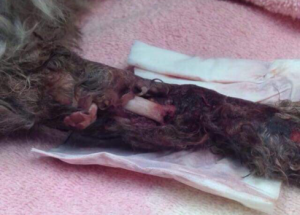 She was immediately given IV fluids, antibiotics and pain medication. The arm was infected and Abigail would need an amputation to save her life. Abigail needed emergency surgery but because she was in shock, she would first need to be stabilized. The next morning after examining Abigail, it was determined that she was stable enough to go to surgery. The amputation had gone successfully without complications. 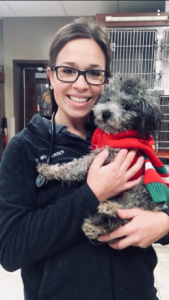 Abigail recovered well from the anesthesia and the next morning she had started walking on her healthy three remaining limbs. She was sent home two days after the surgery. Abigail returned to the hospital frequently for rechecks to make sure the incision was healing properly. Two weeks later, the incision was rechecked for the final time and sutures were able to be removed. She is doing great at home with her family and acting like a normal, healthy happy puppy again!